From Steiffs 2011 Winter Collection we introduce you to the first of two brothers, 11 inch tall Jakob, an adorable Mohair Bear with Tummy Squeaker. Jakob is fully jointed and sewn from a decadent and curly, aged white mohair, which gives a remarkable - smoked - appearance, whilst airbrushing emphasises his charmingly friendly features. With a nod to his 1906 cousins, Jakob has quite the appeal, plus a fun tummy squeaker . 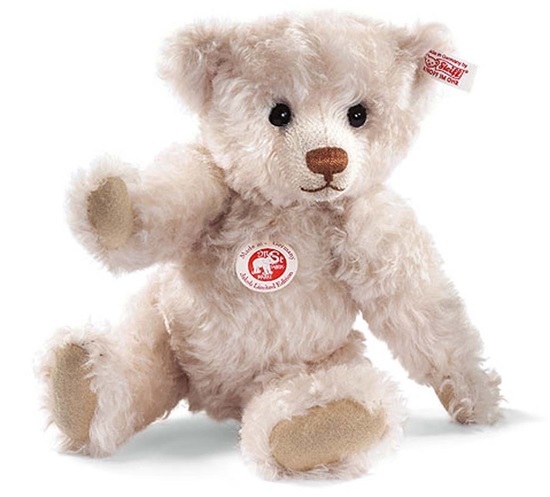 This adorable fellow is a Worldwide Limited Edition of only 1,500 Bears and will come to you boxed with his numbered certificate of authenticity.